Well it finally has happened, researchers have figured out how to make fuel for automobiles from the remnants of whiskey production! It seems like a no-brainer, especially with some of the higher proof stuff, its flamable and some of it tastes like jet fuel, but now its official. The EU has set a standard that all vehicles will be powered by at least 20% biofuel by 2020. Of course we have been putting up to 10% etanol in our gas here in the states for 30+ years, but the new fuel made from the remnants of Scottland’s largest industry is called biobutanol and has a 30% more efficient burn than ethanol. “It uses the two main by-products of the whiskey production process – ‘pot ale’, the liquid from the copper stills, and ‘draff’, the spent grains, as the basis for producing the butanol that can then be used as fuel,” the researchers said. Scotland’s whiskey distillers offer ample by-products for the new biofuel, with 1,600 million liters of pot ale and 187,000 tons of draff produced annually. 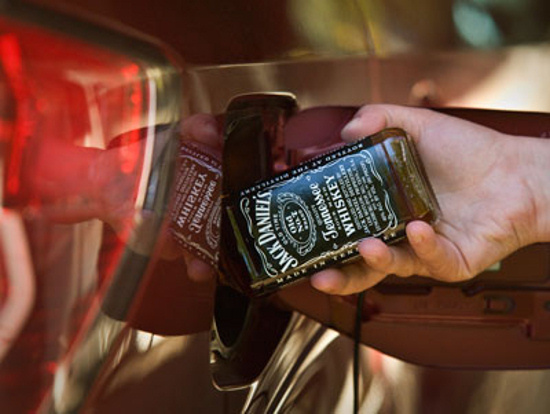 And unlike ethanol, the nature of the whiskey-biofuel means ordinary cars can use the fuel instead of traditional gasoline. The university intends to create a new company to market the fuel commercially, in an effort to make it available at stations. So I say drink up! It’s good for the economy and the world. Who would have thought that the pleasurable act of drinking whiskey would be so good for mankind…a true win, win! ← Pike’s Kilt Lifter; What’s Under There? The last thing I need is for the car to be drinking whiskey, too! OK, ok I guess I deserve this…somehow.